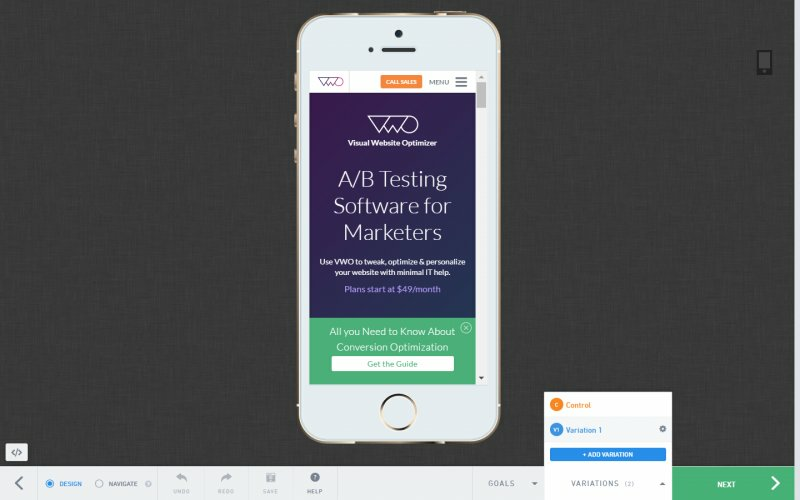 Using VWO, you can create tests for mobile-enabled or responsive websites for visitors accessing your website through mobile and other devices. To create test for mobile-enabled websites, you must select the option to load the pages to mobile device when setting up the test. Only then, VWO will resize and load the website as it would load on the actual device on the Visual Editor where you can edit the interface using VWO point-to-click Editor. ATTENTION This feature is different from creating tests for mobile apps. 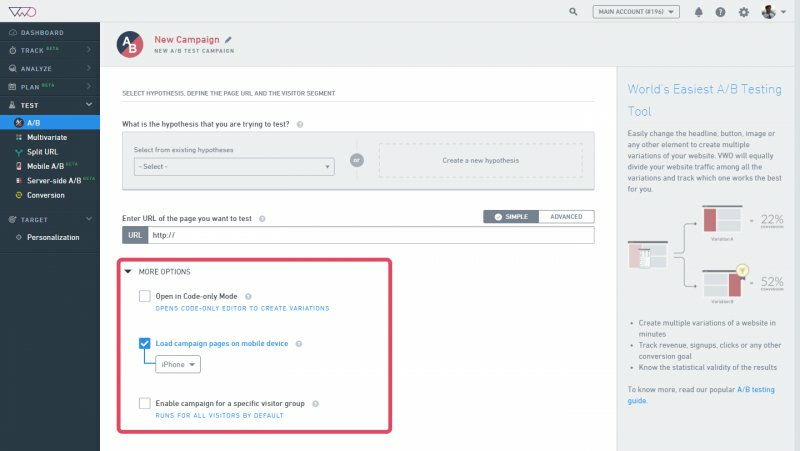 Selecting the device type allows you to make changes on the actual device interface in the editor for creating tests for your responsive websites. To get started, click the test type Test on the navigation menu. Next, in the upper-right corner of the dashboard, click Create. To set up the test, you can start by entering a title for the test by clicking on the pencil icon against New Campaign. Then, select a hypothesis you want to test during the test, enter URLs of the pages and defining targeting options. Select or create a hypothesis you want to test during the test. Every test you create using VWO is measured against a hypothesis or idea you want to implement on the website. If you are just starting out and do not have a hypothesis yet, click Create a New Hypothesis to define a hypothesis for testing. To learn more about creating Hypothesis, click here. Next, specify the URL of the pages where you want to run the test. You can use URL patterns and regular expressions to run tests site-wide and on multiple pages. Click the Advanced tab next to the URL field to include or exclude URLs from the test. Using this tab, you can also define advanced pattern-matching options to include either a broad URL with wildcard entries or a specific URL. To learn more about URL options, click here. Open in Code-only Mode: This is an advanced mode for developers that lets you create variations in a code-only mode instead of using the Visual Editor. Variations created using this mode cannot be later edited using the Visual Editor. To learn more about this, click here. 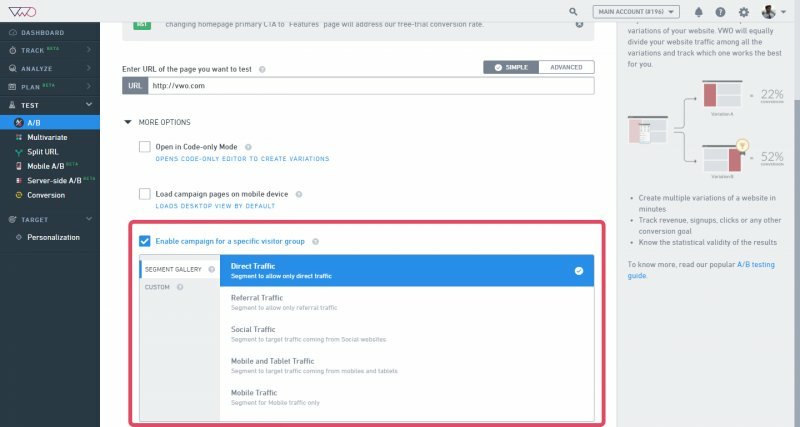 Load campaign pages on mobile device: Per the device you select, VWO will resize and load the website as it would load on the actual device you selected. You can edit the interface using VWO point-to-click Visual Editor. You can now make changes to the website and create variations. To learn how to create variations and further steps in an A/B test, click here. You can define a specific visitor groups to track in this heatmap view using different conditions such as geographical location, user device, and other user behaviors. When you enable a view for a specific audience segment, VWO will record the click pattern of the specified group and plot it on the heatmaps report. To learn more about defining audience segments, click here. To create your own custom segment, select the Custom option to define conditions for a segment. To know more about creating custom segments, click here. PRO-TIP If you want your test to be run only on mobile devices, you will have to explicitly segment it for mobile visitors. Click here to learn how to target your test to a segment.